ElectRelease is a family of adhesives with high strength bonding properties that can be completely and easily removed at a later time. Conductive (metallic) assemblies can be held together very strongly but then disassembled by applying a small amount of electricity. The electrical current causes a chemical reaction to release the bonds between the epoxy and one of the metal substrates. Typical uses include both temporary and permanent bonding applications. Structures and appliances bonded with ElectRelease adhesives can be easily disassembled, allowing re-use and recycling of components. In addition, inexpensive single-use remote release devices can also be fabricated using ElectRelease. These devices can be lightweight, yet mechanically robust and capable of holding large loads. Release is predictable and highly efficient. 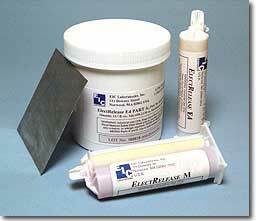 Newly developed is the ElectRelease Foil Patch which can be used to bond nonconducting surfaces. This patch is applied with standard epoxy resins for strong but removable adhesion between two substrates. The ElectRelease resins are suitable for a variety of applications in aerospace, automotive, shipbuilding, defense, and other manufacturing. ElectRelease is an EIC Laboratories technology with patents pending worldwide. All images and text on this website are Copyright 2004, EIC Laboratories, Inc. All rights reserved.